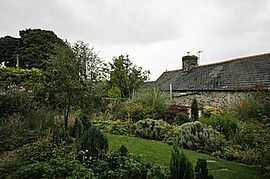 It is set in the small Hamlet of Sarnau just off the A 494 trunk road and is 3.5 miles from the market town of Bala and Llyn Tegid (Bala Lake) which is within Snowdonia National Park. Really easy to get to from the South, North and Middle England and Scotland. I have guests from Ireland who arrive at the port of Holihead. To the east of Sarnau lies the Clwydian Range a designated area of Outstanding Natural Beauty. 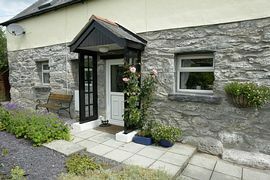 Sarnau is situated in the centre and is ideal for touring and exploring some of the most spectacular and beautiful parts of North and Mid Wales and for walking and bird watching at the RSPB sites at Lake Vyrnwy or at Conwy. 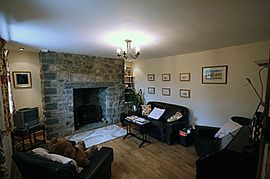 Pen y Banc is It is cosy, comfortable, relaxing and well equipped. 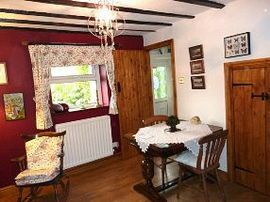 Originally two cottages built at least two hundred years ago, it retains some original features but has more modern attributes including double glazing. �The bathroom has over the bath instant electric shower, shaving point. �The kitchen is fitted and well equipped, including a washing machine. �There are secure facilities for storing and cleaning bicycles. �Parking to the side of the cottage. �The tariff includes all electricity, gas, and first supply of logs and coaland disposable kitchen items, e.g. Paper towel, washing powder and washing-up-liquid. �A travel cot, high chair, stair gate can also be provided at no additional cost. Smoking is not allowed in the cottage or covered way, although you can smoke in the garaden if you wish. One well behaved dog may be considered. 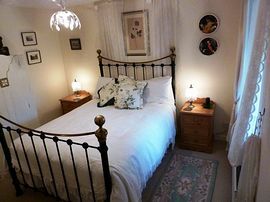 As a four star cottage the cost of your holiday includes all linen. There are no hidden extras. Exceptionally good value for money for a 4 star. It has a beautiful cottage garden with a summer house. This is the rear cottage garden. All quality linen provided including tea towels, towels, quality bedding, duvet, shees, pillow cases, bed spread and spares in blanket box. Blankets can be provided if prefered by customer. Bath mat.Three towels per person. Table cloth, napkins. One well behaved dog considered at no extra charge. It must not be allowed on furniture and must not be allowed upstairs to ensure the health of other guests. The linen is white and the carpets upstairs light. Down stairs vertually doggie proof.Your pet must not be left alone, one chewed the door frame. No smoking allowed in the cottage or in the covered way. Private secure cottage wild life friendly rear garden. It has a pond which is covered. Front garden with bench, but not entirely secure for small children or animals. Garden furniture, swing, charcoal barbeque. Parking at the side, secure area for bicycles, hose and puncture kit. Local Services: Sarnau is a small hamlet. It does not have a Pub or shops. The market town of Bala is 3.5 lies to the west or Corwen six miles to the east. Bala has shops, Pharmacies, Banks, Garage, Doctor, Vet,Cafes,Restaurants. Leisure Centres in Both Corwen and Bala with Swimming pools. Bala has a small cinema. Lots of water sports, bird watching, walking , cycling, sightseeing or even just resting. You can set off on beautiful walks straight out of your front door up the lanes to the lake, forest and moors. Across the road A494 is a place of SSI for bog plants and amphibians. Lots to do and walking directly from the front door. Pen Y Banc Cottage, (this means top of the bank) is located in the small hamlet of Sarnau, 3.5 miles East of the town of Bala and approximately 5.4 miles from the A5. Take the A5 to Bala and pass Sarnau, which is on the right hand side, set back off the main trunk road. After turning right into the hamlet of Sarnau, Pen y Banc can be seen as you travel up the hill. The front of the stone cottage is rendered half white. It can also be identified by the two Velux Windows in the roof. It is surrounded by a stone wall with a mixed hedge and shrub on top of the wall. The name of the cottage is on the wall by the kitchen window and above the front gate. There is parking for one vehicle at the side of the cottage. It is possible to park two motor bikes or bicycles in the covered, secure car port if required. There is unrestricted parking in the hamlet of Sarnau for additional vehicles. 2013 Full weeks are from £285.00 Low Season to £525 High Season all inclusive. No increase for half term February and October. Short Breaks available at £85 per night per cottage hire. Otherwise Guests are asked to leave by 10-30am to allow for cleaning and preperation for the next guests. Short breaks of three or four days are also available especially at short notice.